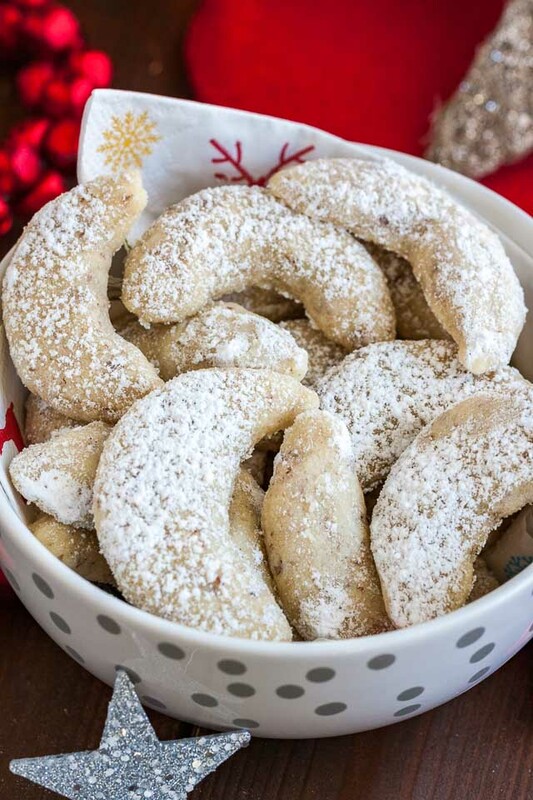 Vanillekipferl (German Vanilla Crescent Cookies) are traditional German Christmas Cookies made with ground nuts and dusted with vanilla sugar! They are tender, nutty and melt in your mouth. A perfect cookie to make ahead that’s always a hit. 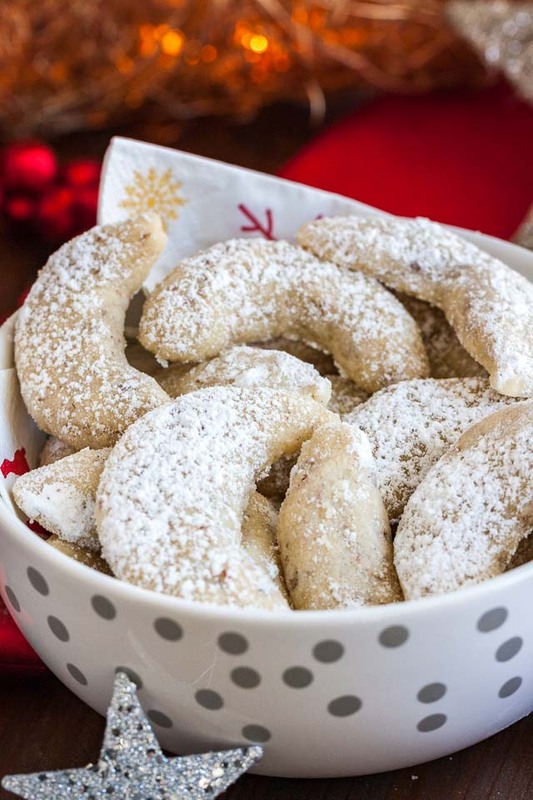 Probably every German grandmother makes Vanillekipferl at Christmas time. But they can also be enjoyed all year round!You only need a few ingredients to make them and they keep fresh for weeks. Like German Gingerbread and Traditional German Stollen, they get even tastier after a few days in my opinion. One of my favorite Christmas memories is baking cookies with my Oma (that’s the German word for Grandmother). I always made sure there were enough cookie dough scraps for me and my Grandfather to enjoy. Both my grandmothers always made many different cookies during Christmas time. One even made about 20 different ones, I really don’t know how she accomplished that but I loved going through all the cookie tins and filling my cookie plate with all my favorite Plätzchen (German for cookies). These Vanillekipferl were one of them! Vanillekipferl are made WITHOUT eggs! Eggs (and baking powder) are not used in traditional recipes, you won’t get the same melt-in-your-mouth texture if you are using eggs. The dough should always stay cold while you are shaping the cookies. Take only 1/4 of the dough out of the fridge so the remaining dough stays cold. Shaping the crescents might take a little bit especially if you’re doing it for the first time. 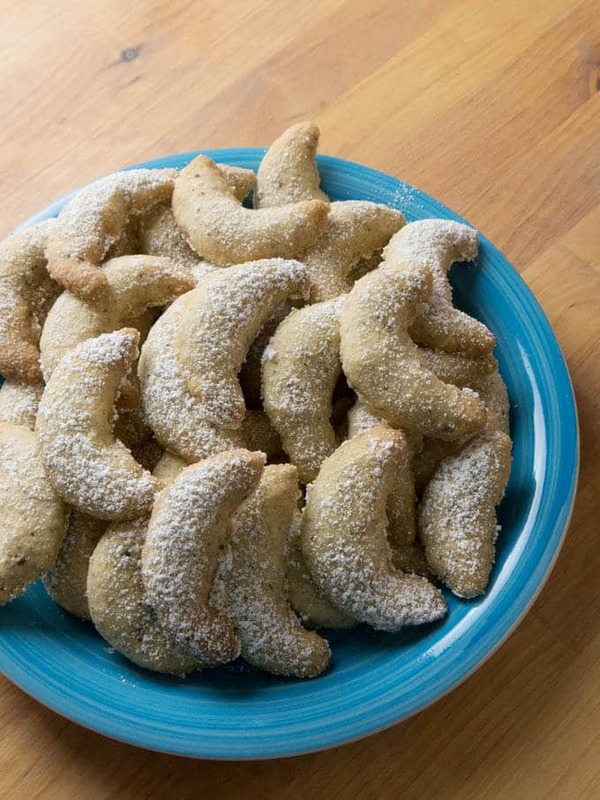 Make sure your crescents are all the same size so they bake evenly. Don’t bake them too long! They should not brown, only the edges should be a little bit golden but the cookie should be pale. In my opinion, dusting the vanilla cookies with vanilla sugar works better than dipping them. It’s easier (and safer) because you don’t have to touch the hot cookies and dip each one into the sugar. 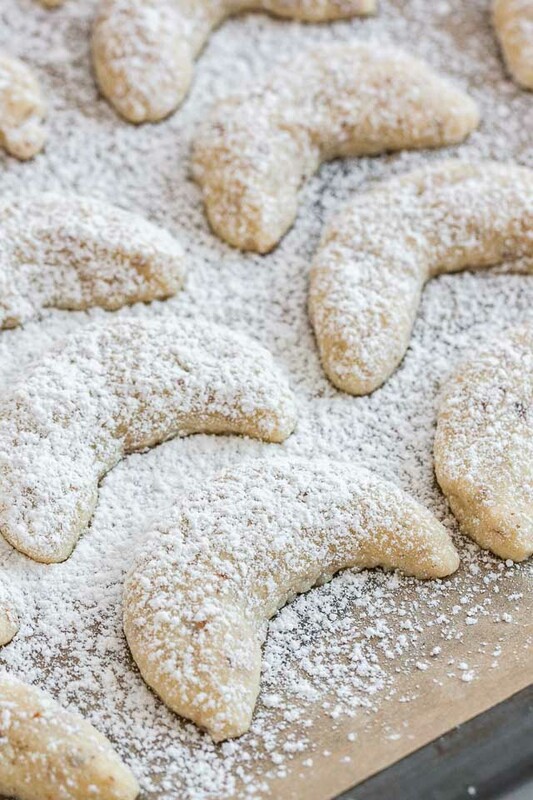 Sprinkle the cookies with half of the vanilla sugar immediately after you take the cookie sheet out of the oven and then repeat the process when they are cooled completely. Store the cookies in a cookie tin. That’s the way it’s done in Germany. The cookies will stay fresh for weeks in a cold and dry place. 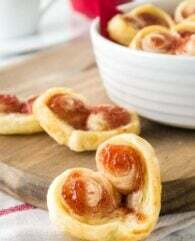 Traditional Vanillekipferl are made without eggs or baking powder. The only binding agents are the butter and the nuts. 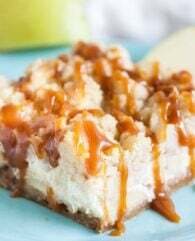 When you make them for the first time you might think this recipe won’t work because when you combine all the ingredients and start mixing the mixture will look very dry and crumbly. Don’t worry, the mixture will come together after about a minute or so. You will get a dough that looks like crumbs at first, press the crumbs together with your hands to form it into a ball. Don’t handle the dough too much you don’t want the butter to get warm. Chill it for an hour and then form crescents. 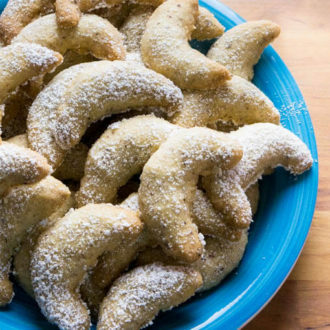 German Vanilla Crescent Cookies are only baked for about 15 minutes until the edges are lightly golden, you don’t want them too brown. Take the pan out of the oven and dust them with vanilla sugar. Many recipes say you should dip them in the sugar mixture but I find it easier to dust them because the cookies break very easily. These cookies keep fresh in an airtight container for up to 3-4 weeks. But most of the time they’re all eaten long before then! For this recipe, you need vanilla sugar (German: Vanillezucker). 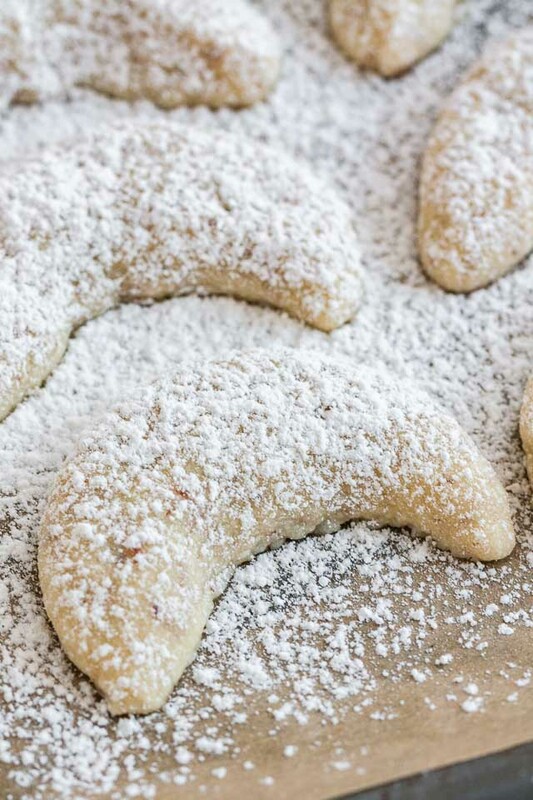 The Kipferl are dusted with a mixture of vanilla sugar and powdered sugar, this is a very important step to make them. You can buy Vanilla sugar (see link above the recipe) or make your own. It’s really easy and you can use it also for your coffee or other recipes that use sugar and vanilla. Vanilla sugar is used in many traditional German recipes instead of vanilla extract which is difficult to get in Germany. To make your own vanilla sugar you need 1 cup sugar and 1 vanilla bean. Place the sugar into the bowl of a food processor. Scrape out the vanilla bean using the back of a knife and add the scraped out seeds to the bowl. Pulse the sugar and vanilla seeds until well combines and the sugar resembles powdered sugar. Store your vanilla sugar in an airtight container or mason jar in a cold and dry place. I always add the scraped out vanilla pod to the jar this adds even more vanilla flavor. 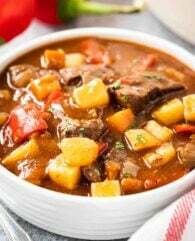 Looking for more traditional German Christmas Recipes? This one is made with real vanilla, don’t buy one with artificial vanilla! The cheapest way is to make your own. This almond meal/flour is made from finely ground almonds and perfect for making Vanilla Crescent Cookies. You can use almond meal with or without the skins or use the same amount of ground hazelnuts or walnuts. Storing the cookies in cookie tins like my Grandmother always did keeps them fresh for weeks. In the bowl of a stand mixer fitted with the paddle attachment combine flour, salt, cubed butter, powdered sugar, ground nuts, and vanilla seeds. Mix at medium speed until a crumbly dough forms, about 1-2 minutes. If the dough is too crumbly add 1-2 Tbsp water. Use your hands to press the dough together and wrap it in plastic wrap. Chill the dough for one hour in the fridge. Preheat the oven to 350°F (177°C) and line one or two baking sheets with parchment paper. Roll the chilled dough into a log approximately 1/2 inch thick. Cut the log into 1 1/2-inch pieces, form the pieces into small cylinders and taper the ends into dull points. Bend each one into a crescent shape. Place the Vanillekipferl on the baking sheet about 1 inch apart. Bake the Vanillekipferl one cookie sheet at a time for 12 to 15 min (depending on the size of the cookies) until the edges are golden. They should not brown. Combine powdered sugar with the vanilla sugar and sift the mixture over the hot Vanillekipferl. Let them cool completely then give them a second dusting. These cookies keep fresh for about 3 weeks in an airtight container stored in a cool place. Watch how to make them! We posted this recipe 2 years ago. Today we’ve updated the photos, improved the recipe, and included a video tutorial to show you how easy these cookies are to make. Everything was going great . . . until post-chill. No matter what I did it was too crumbly. It smelled delicious but crumbly. What I did then, to salvage the situation, was to take a portions worth and press it together in my hand over and over – almost like kneading – until it held the shape. They were not as pretty but it was a crescent. End result? Delicious. I also did not dust the sugars on. I rolled it once top and bottom before putting it on the wire rack and then again before I put it in the container – shaking off the excess. That was just a personal preference. Crumble aside, sorry, a tasty crumble aside all went well. Hi Julia, I just made the dough, let it rest in the fridge for an hour and when I tried to roll it it kept on crumbling. Is there a way to rescue my dough? Try cutting the dough into 4 parts and knead every part by hand until it is smooth. Then shape the parts into rolls, cut them into pieces and form the crescents. Cool them for at least 30 mins so the butter in the dough gets cool again. Hope that helps! The recipe was delicious! However, they became super spread out that it almost looks like a full circle cookie instead of the beautiful crescent shape. What did I do wrong? I baked it straight out of the freezer, 350F for 13 min. Mmh not sure what happened, they should not spread that much. Perhaps because you baked them straight out of the freezer, how long were they frozen? The easiest way I’ve found to grind the nuts is to use a blender, and just drop a few at a time in thru the top opening, Cover the opening with your fingers and just drip a few at a time while blender is running between your fingers. Result is fluffy, not stuck together, very similar to the result if you actually grate each nut on a grater (which Mom did back before blenders). The cookies can be made into balls rolling between your palms, then squashed down a little with the bottom of a glass, These take the same baking time as the crescents, but are way faster to make. Mom also had the wooden form, and actually weighed each portion of dough so they would all be the same. Lots of work but still a family favorite. Your recipe calls for 2 cups, or 250 grams of flour. However, 2 cups of flour is 280 grams. My friend just tried to make this, and measured 2cups of flour, as stated in your recipe. All that flour has made the dough very dry, and its impossible to form Kipferl from that. Please note that 2 cups do not always equal 250 grams. It depends on what you’re measuring. I’m german, and grew up metric. Hi Trudy, A cup of all-purpose flour weighs 4 1/4 ounces or 120 grams. So 2 cups are actually 240g. Many people measure incorrectly and just scoop flour with a measuring cup out of the bag of flour, this results in too much flour. To measure correctly, your friend should always spoon the flour with a spoon into the measuring cup and then level the cup with the back of a knife. Even though I live in Canada I was born in Germany so I have a lot of experience converting metric to imperial and the other way round :) Happy Holidays! Wonderful!! My family loves them. I did use almond flour but added 1 1/2 tbs water (helped with binding tremendously). Is it possible to substitute the vanilla pod with vanilla extract? Yes, you can use 1-2 tsp vanilla extract in the dough instead of a vanilla pod. I am a bit confused as to the ground almonds, is it almond flour I buy? or do I buy ground nuts? or can I grind them myself? sorry for such a silly question but when I clicked one of the links it brought me to almond flour and that is when I got confused. Can you add almond extract for more almond flavoring? Sorry for the confusion! Grinding the almond yourself in a food processor or blender is the best and cheapest way, using whole almonds ensures that the ground almonds are fresh and not dried out. Some grocery stores also sell ground almonds in the baking aisle which would also be good because they are not as finely ground as flour and contain more moisture which is important in this recipe. Almond flour is too dry most of the time and makes it necessary to add a tbsp of water or more to get to the right consistency. Yes, you can add almond extra for more flavor. Depending on the extract you need to use a few drops or about 1/2 – 1 tsp. Hope this helps! Hi is it possible to make these with gluten free flour? I’m not sure, I don’t have any experience with gluten-free flour. Sorry! I made them with bob’s red ill gluten free flour, they turned out great. Have you ever tried them with almond extract instead of vanilla…just wondering because of not having the vanilla bean. What do you think? Yes, using almond extract instead of vanilla will work. They will have a more intense almond flavor which I really like. Happy baking! What if my grocery doesn’t have vanilla bean? You can use 1-2 tsp vanilla extract instead for the dough. Can you just slice the log of cold dough to make circle cookies rather than form crescents? I haven’t tried this but I think it will work. You just have to keep an eye on them while they are baking because the baking time might be shorter or longer depending on the size of your cookies. My German grandmother made a similar recipe. She would roll in into a log wrap it in wax paper and freeze it till firm then slice it and bake it then roll it in powdered sugar. She used a rind of a lemon in place of vanilla. Maybe she didn’t have vanilla back then? But they e were delicious!!! Nuts roasted or not? I made them used roasted almonds, just wondering if they would taste different if the nuts are not roasted. Unroasted nuts are traditionally used and yes, they will taste a bit different with roasted nuts. Roasted nuts taste stronger and might also be a bit drier. I used almond flour. The dough was really too crumbly to work with. You could get it to hold together if you didn’t try to shape it. I ended up adding about 2 tablespoons of milk. I didn’t measure, just carefully added milk until the dough clung to the beater. It will take a few times for me to make really pretty crescents, but it was a cool new recipe for me to try. The almond flour that you buy pre-ground is not the same as grinding the almonds yourself. They extract the almond oil from the flour and sell it. So you might need to buy almond oil and add it back in if you are buying the commercial almond oil. Can you use vegan butter in this recipe? Thanks! I prefer butter but margarine will work too in this recipe. Do you think these could be made with almond flour instead of ground almonds? Freshly ground almonds have more moisture than almond flour so the dough will be more difficult to handle. It might work if you add a tablespoon or two of water. Can you make it with almond flour instead of ground almonds? Is there a way to make them without nuts? No, unfortunately not. The nuts are the main ingredient. I have my grandmother’s recipe. She always weighed her ingredients so we had to measure them after she weighed them. She had a scale with weights and my cousins got the scale after she passed. And she used a wooden mold that she put the dough into and then turned over and slammed it on the table. I think they got the mold too! Brings back lots of great memories. 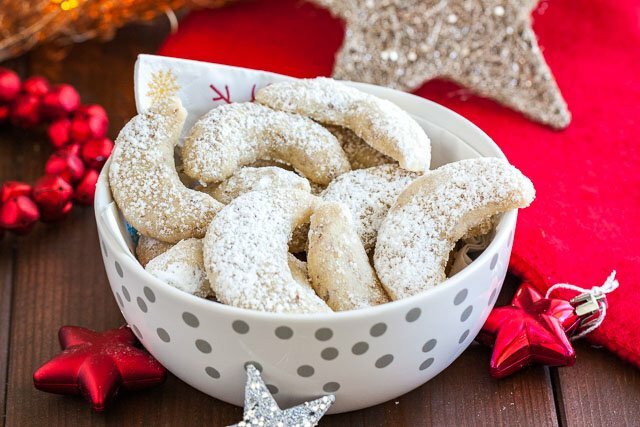 These are so perfect for a cookie exchange because they’re a little unexpected but such a crowd pleaser! Also they’re delicious with a cup of coffee! I love these! They taste just like a cookie my grandmother used to make when I was growing up! Thanks for the recipe! These are delicious but tricky to make. The mixture is easy enough, but the dough is extremely crumbly. I had to warm each piece in my hand before I molded the crescent on my counter. But I guess that is the price one pays for this yummy treat. If anyone has a remedy or a difference experience would like to know. I didn’t have a mother or grandmother who made these, so I’m working in the dark. I really love the different countries traditional Christmas cookies. When my kids young I’d go all out and make dozens of different types of cookies. I’ve slowed down but these cookies are a must on my list this year. Hi! I haven’t made these yet, but they look delicious. I’m allergic to nuts, and was wondering if I could substitute the nuts with something else. Would that work, or would it affect the taste or consistency? They are traditionally called nusskipferl, as in nut horns. So the nuts are important I can’t see how you can do these without nuts. My Austrian Grandmother has been making these for over 50+ years with walnuts. I noticed there was no mention of egg in the recipe. The dough looks very crumbly. Will the butter be enough to bind the ingredients? Hi, Dina! Yes, the butter and the almonds (or hazelnuts) are enough to bind the ingredients. 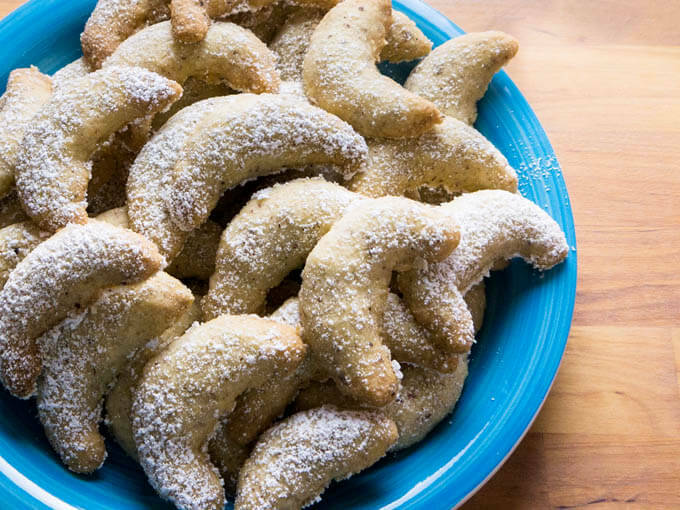 These cookies are traditionally made without eggs. If your dough is too crumbly I would add a little bit more butter. Happy Holidays!